Lately I’ve been thinking a lot about this wanderlust that is so much a part of me. I know I got it from my dad, this yearning for new roads, new places, new sights. 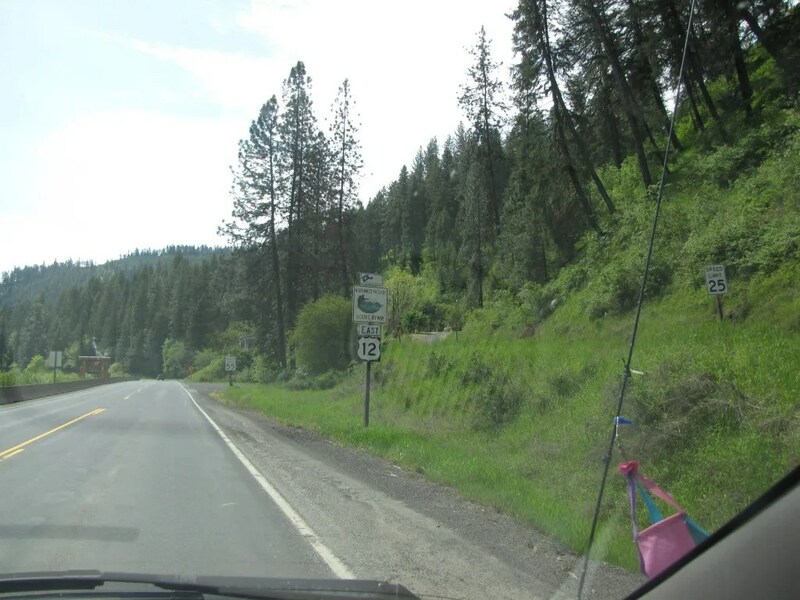 When I was planning this road trip, I could’ve stuck to the shortest route, the fastest route, the most direct route, to Orofino. But instead, longing for something off the beaten path, Nolemana and I discovered Juliaetta, Kendrick, the drive through the lovely countryside, and to top it all off, an amazing sunset. Most people I know like to take the quickest way to their destinations. But back roads are a siren song to me, and I follow their call whenever I can. 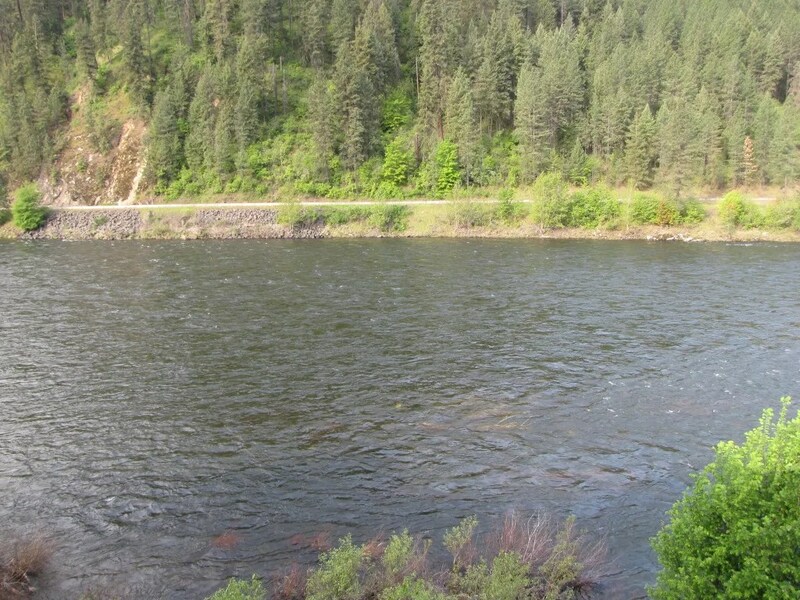 We could’ve gone along Highway 12 alongside the Clearwater River, and I know we would have enjoyed that drive too. But I just didn’t want to take a highway, where there would be more traffic and fewer places to stop. I’m really happy that we took the turnoff towards Kendrick; but if we’re out that way again, we will take the river view. Why? Because I haven’t seen it yet! Nolemana is content to let me do the planning, whether it’s the route we take (though I do show him on the map where I’d like to go and see if he’s okay with that.. I’m not a despot, or anything!) 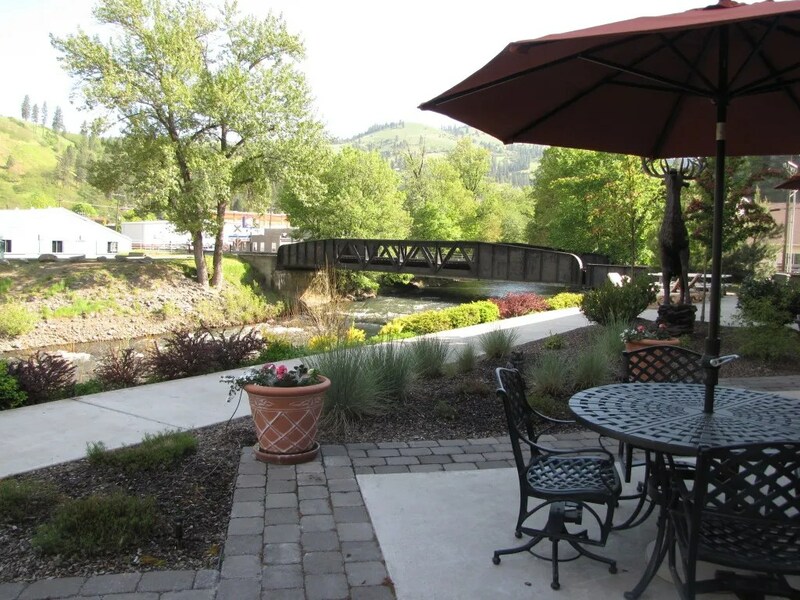 Because we usually like to stay at Best Western motels, I chose the one in Orofino for us to stay at. 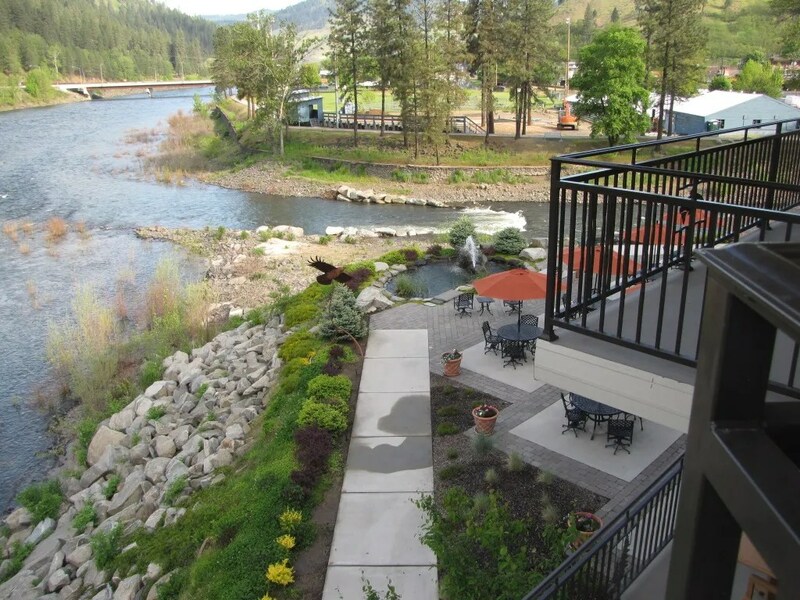 We paid an extra ten dollars for a room with a river view, which was an excellent choice. We left the sliding door to the balcony open, and I let the river sing me to sleep. Talk about a great motel! When we arrived, it was dark of course, so we had no idea what to expect when we woke up in the morning. And the minute we got up, we knew we’d made the right choice of where to stay, even though it was only for one night. This is the view that greeted us the next morning! No can believe, yeah?? 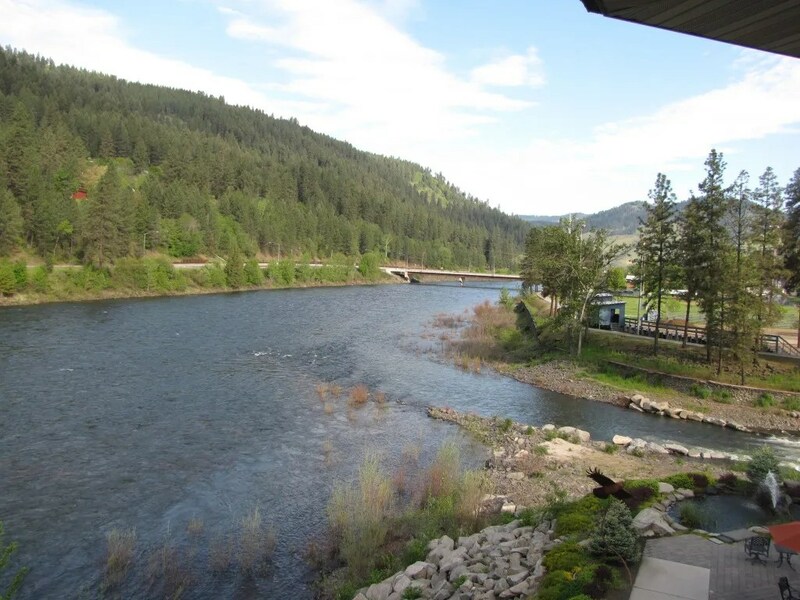 That is the Clearwater River, and its beauty just took my breath away. “Eh Nolemana, try look dis view!! Wikiwiki, hurry up! !” I hollered. I grabbed my camera, and started taking photos. I had no idea it was going to be this beautiful here! This is the view looking to the right of our room. 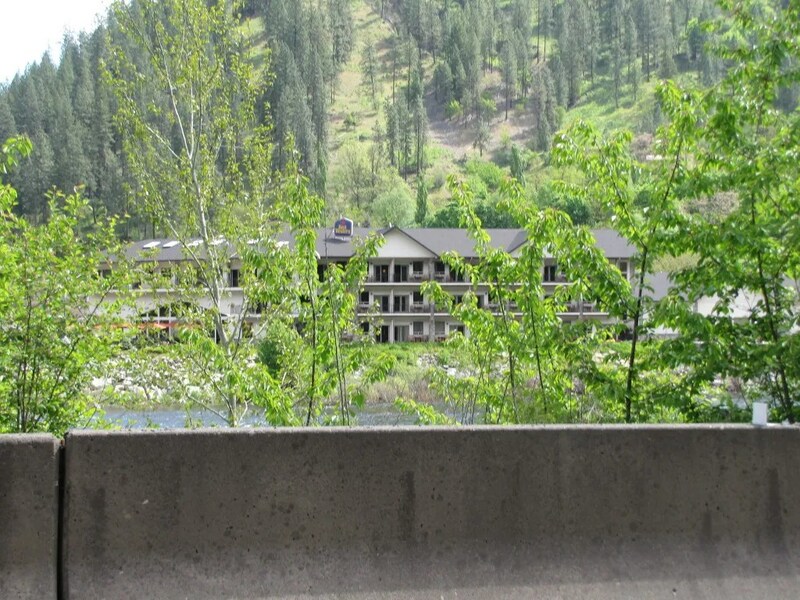 The creek you see coming into the Clearwater River is Orofino Creek, down below that is the motel’s lānai, and the bridge over the river leads back to Highway 12, which is where we’ll be going in a bit. Here’s another view of the lānai, with a wonderful water feature. It was a lovely morning, warm enough to go outside. 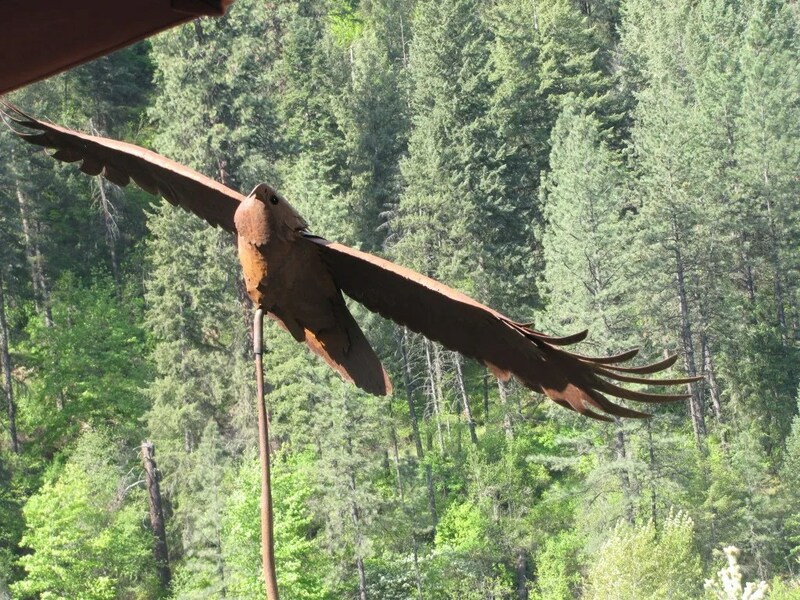 Can you see the osprey sculpture down there? I was just mesmerized by that amazing view, and just stood there, listening to and watching the water from our balcony. I am an island girl; I grew up and saw the Pacific Ocean almost every single day of my life. Water draws me like a magnet. So while Nolemana got dressed, I kept taking photos. If you look carefully, you can see the rocks underneath the surface of the water. This was the clearest river water I’d ever seen, and now understood how it got its name. 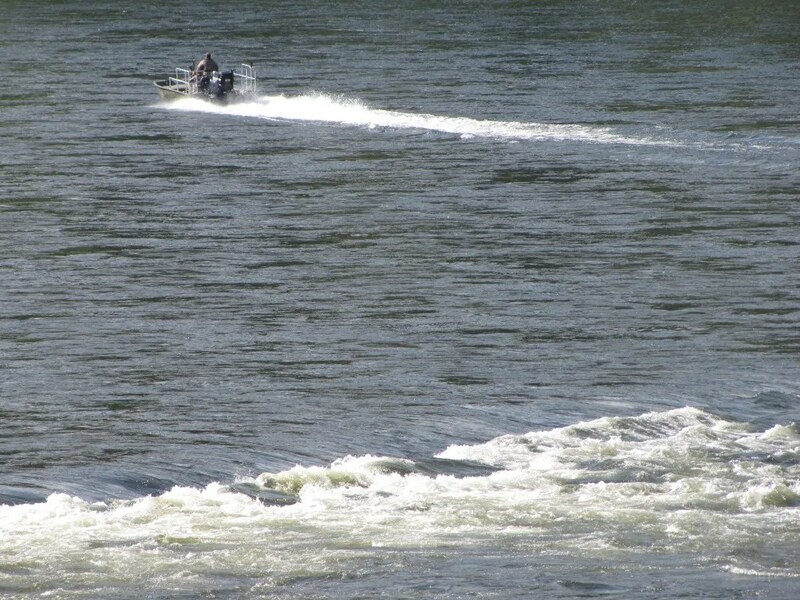 As I stood there, a fisherman zoomed by in his boat. And away he went. 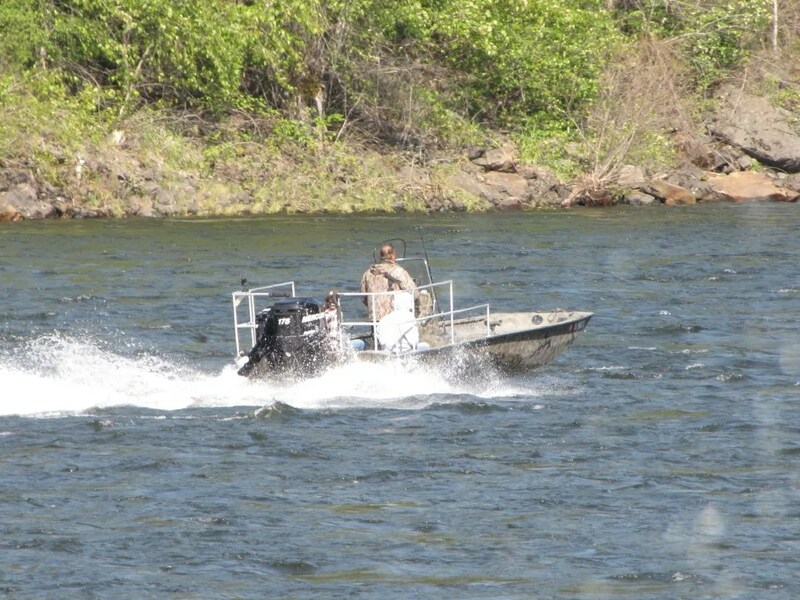 I wondered how far upriver he was going to go, and wouldn’t have minded being out there myself. While Nolemana finished getting ready, I went downstairs for some coffee and breakfast. Continental/free kine! I went out on the lānai to eat; it was a glorious morning and I wanted to get closer to the water. 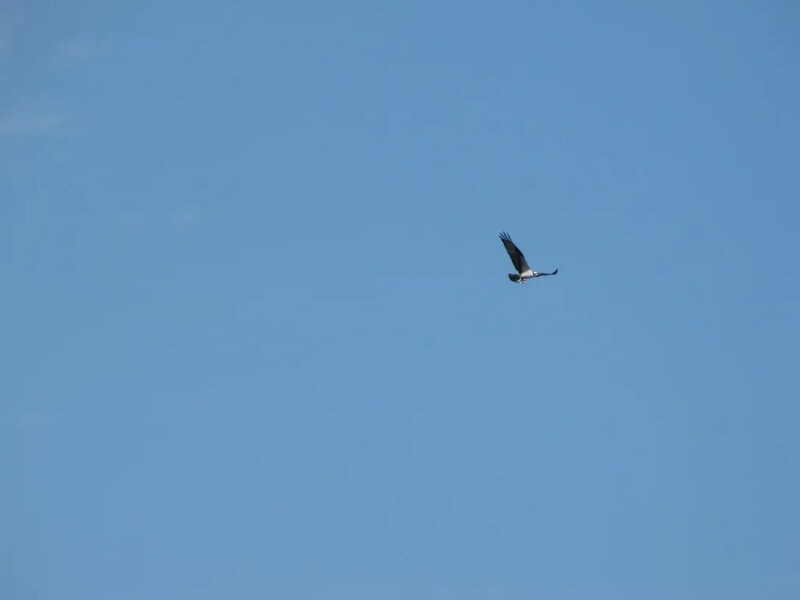 I don’t know if you can see it or not, but while I sat there, an osprey flew by! 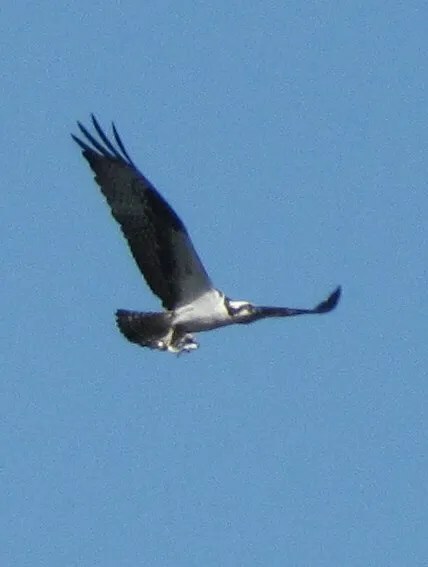 It’s not a fabulous shot, but he was going pretty fast and I was lucky to get him at all. 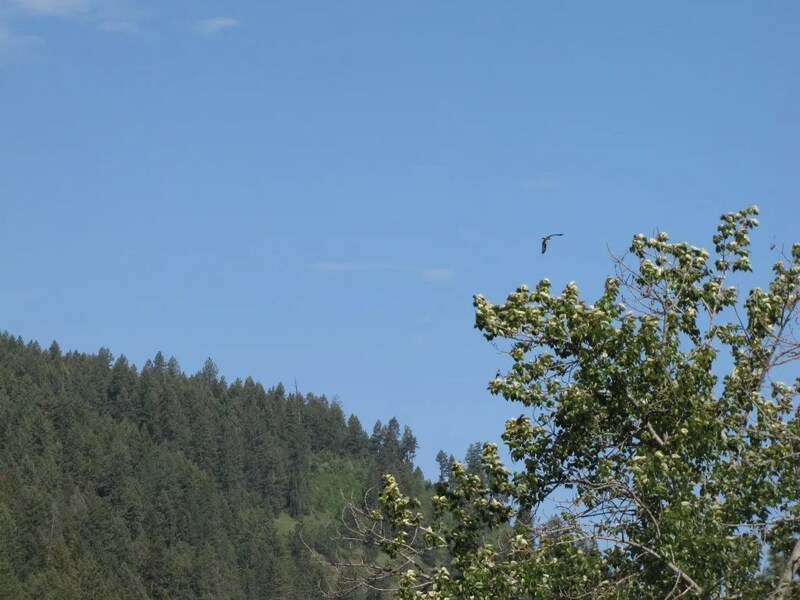 And I cropped it so you can really see how beautiful is this bird! Well, here comes the fisherman again! And here’s the gorgeous osprey sculpture I mentioned earlier. Now this is one sculpture that I would have loved to kakaroach or buy… maybe buy moa betta, yeah? 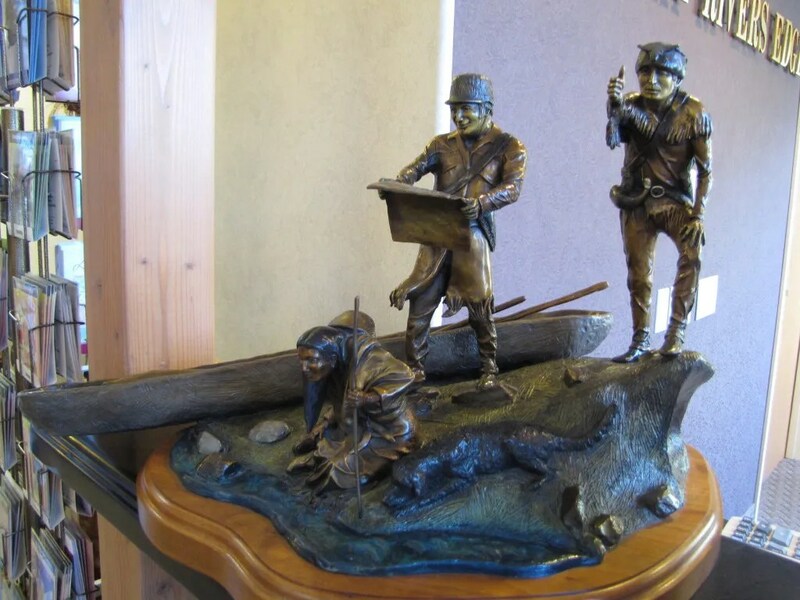 It’s of Lewis and Clark on their journey westward, and as I’ve mentioned before, William Clark is one of my ancestors. The detail in the sculpture was wonderful, and I stood looking at it for a long time. 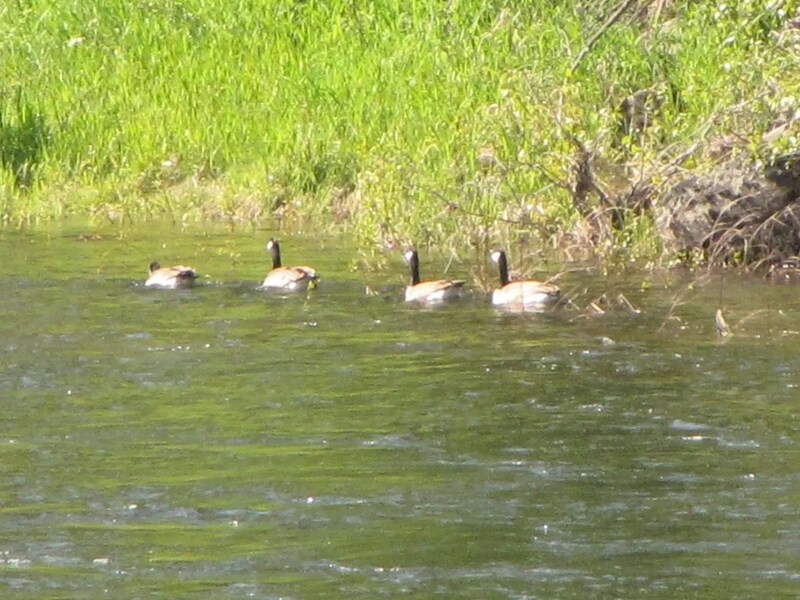 Back out at the river, a gaggle of Canada Geese swam by. 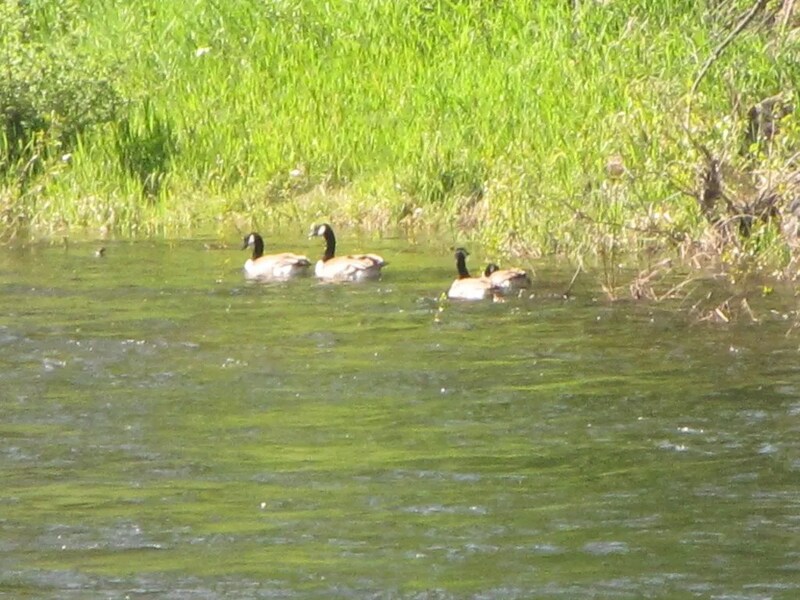 I’ve probably said it ukubillion times before, but I love Canada Geese. 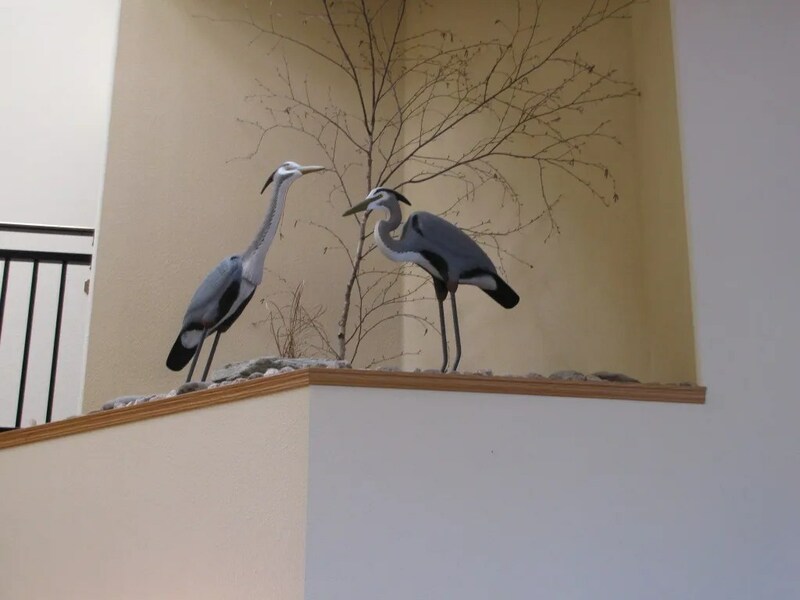 Back inside the motel lobby I saw more beautiful sculptures, this time of two Great Blue Herons. And they weren’t just stuck up there; they’d been set in a very natural setting, with tree branches and rocks to enhance them. 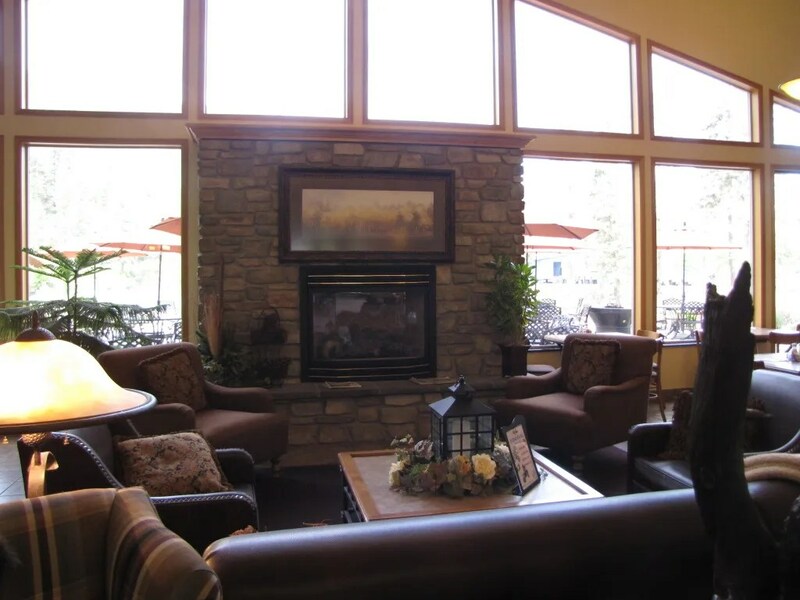 This is the fireplace in the lobby. I tell you, I could’ve stayed in this motel for days, just relaxing and enjoying the view. Ack! Get one bear up dea!! Run foa yoa life!! 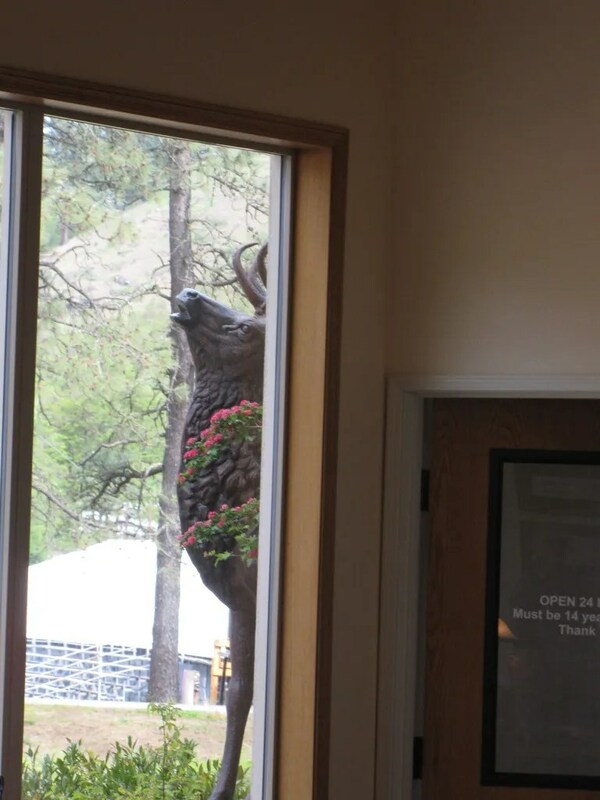 Outside the window, out on the lanai, was a bronze elk trumpeting. Ack again! 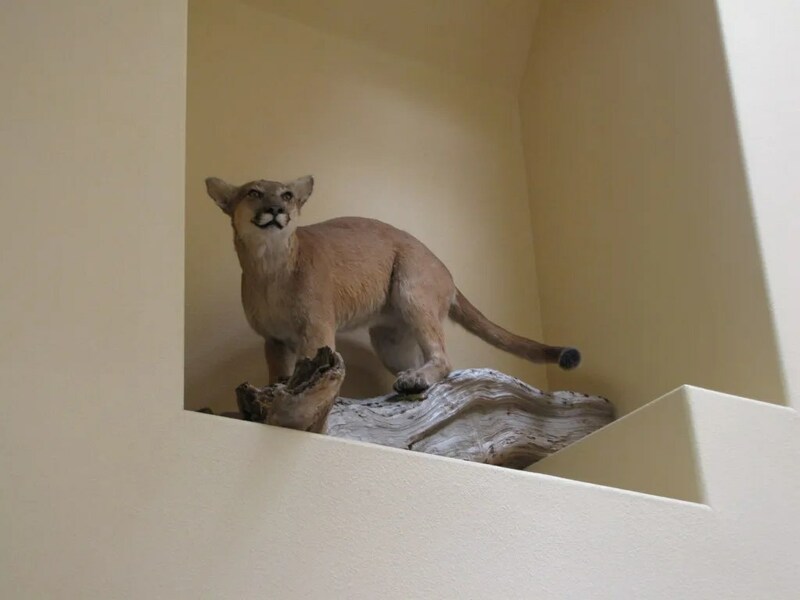 A cougar! 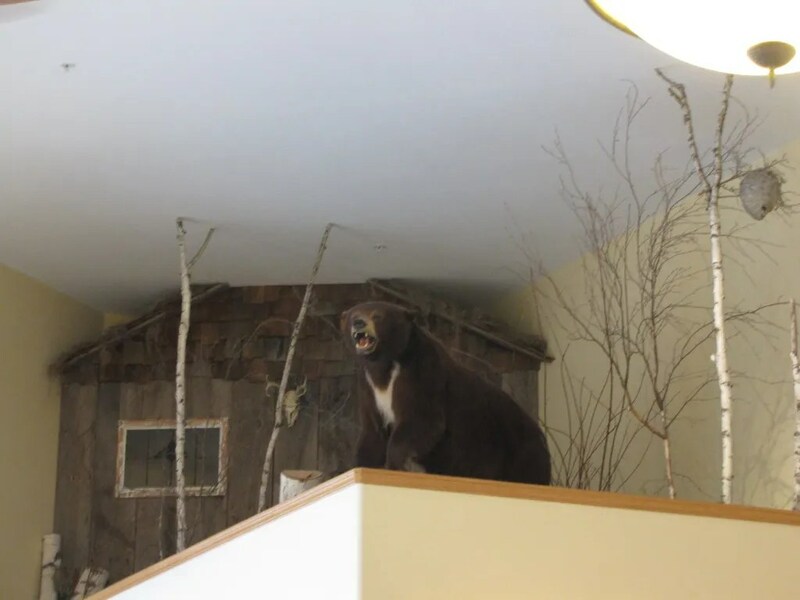 I think he and the bear were alive at one time. These were definitely not sculptures. 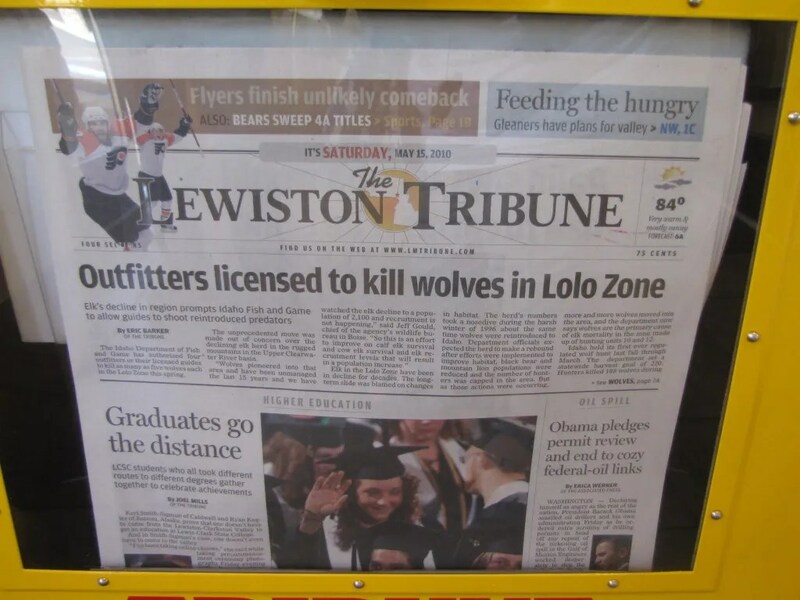 My local kine friends are gonna love this headline from the newspaper in the lobby. “Lolo” means “crazy” in Hawaiian. 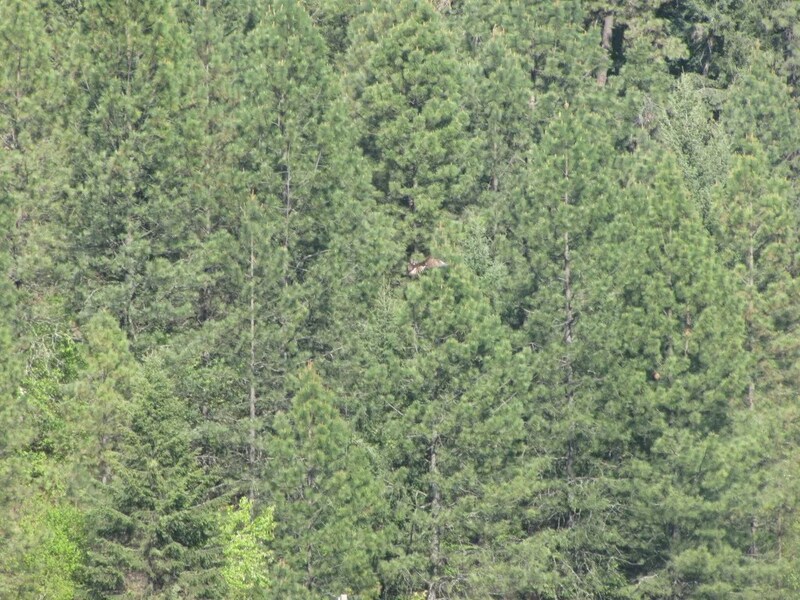 But up here, it’s the Lolo National Forest. And check out the expected high temperature for the day. I took this photo as we were reluctantly checking out of the motel. Yet at the same time, I was anxious to be on our way, because our next destination was my cousins’ house! 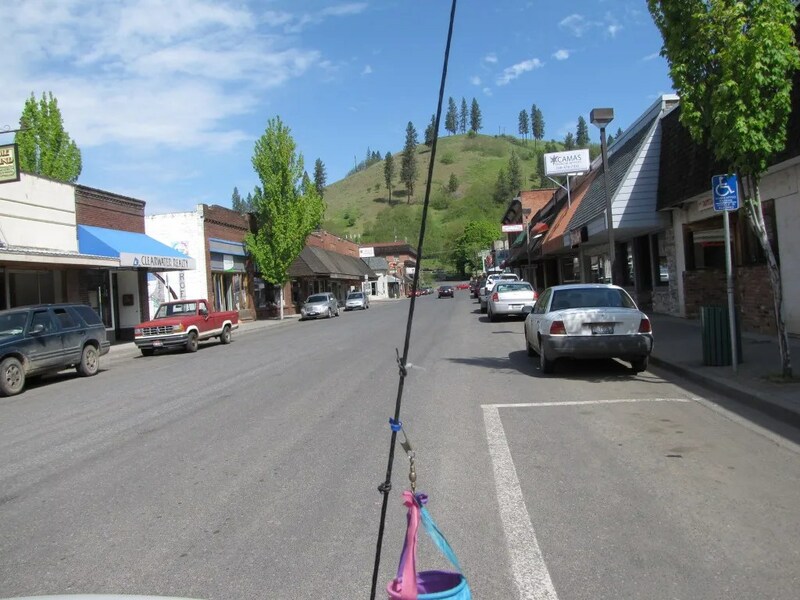 We drove around Orofino to take a few photos for our photo journal. This is Johnson Avenue looking northeast. 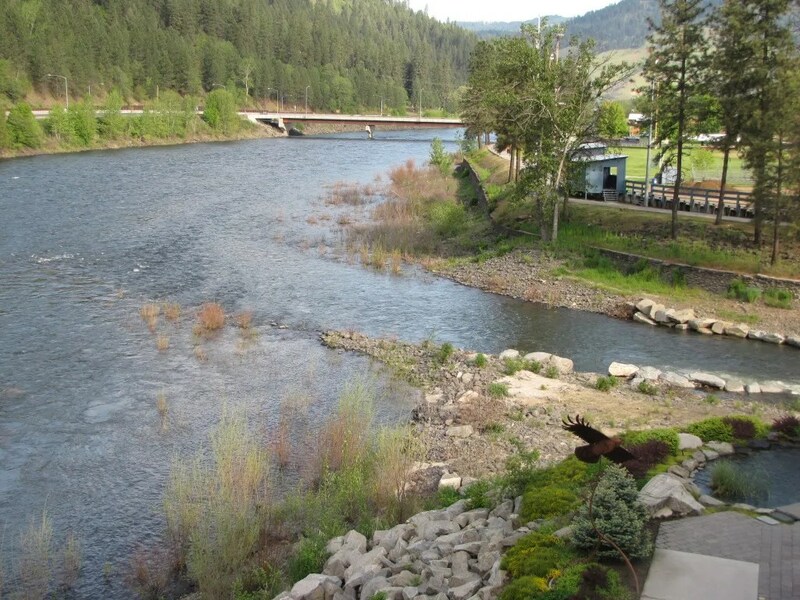 We left Orofino, and drove over the bridge that spanned the Clearwater River. 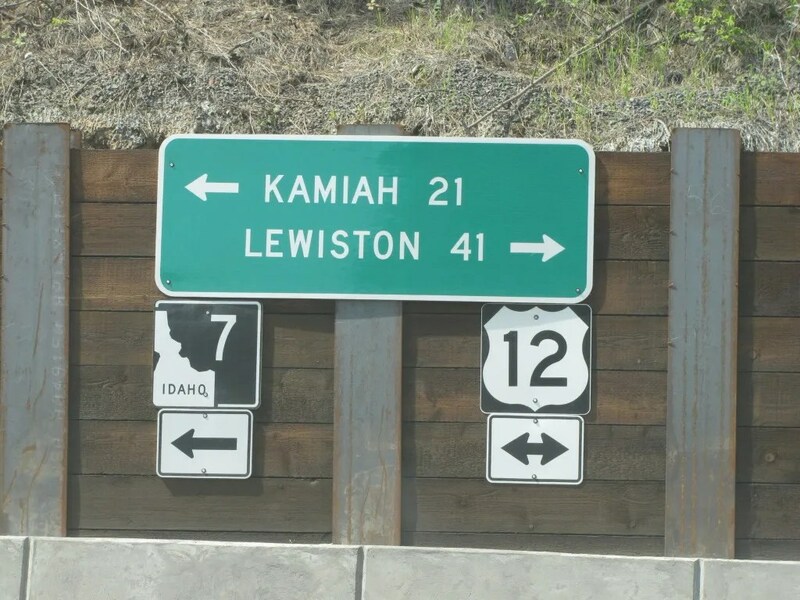 The bridge road dead-ends on Highways 12, and we were turning left (northeast) towards Kamiah. I love the Indian names around the Pacific Northwest! 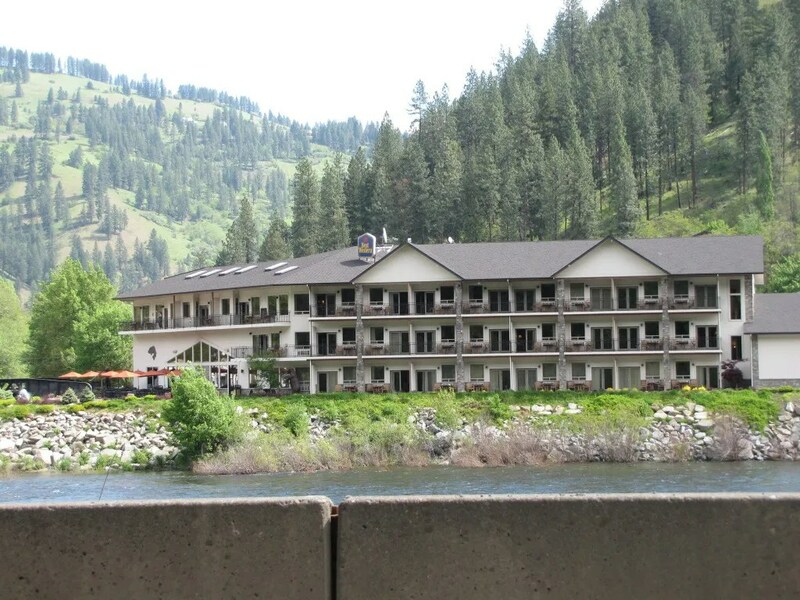 There’s the Best Western Motel across the river. What a lovely setting for it! We were both so glad that we’d stopped here and would like to go back again. 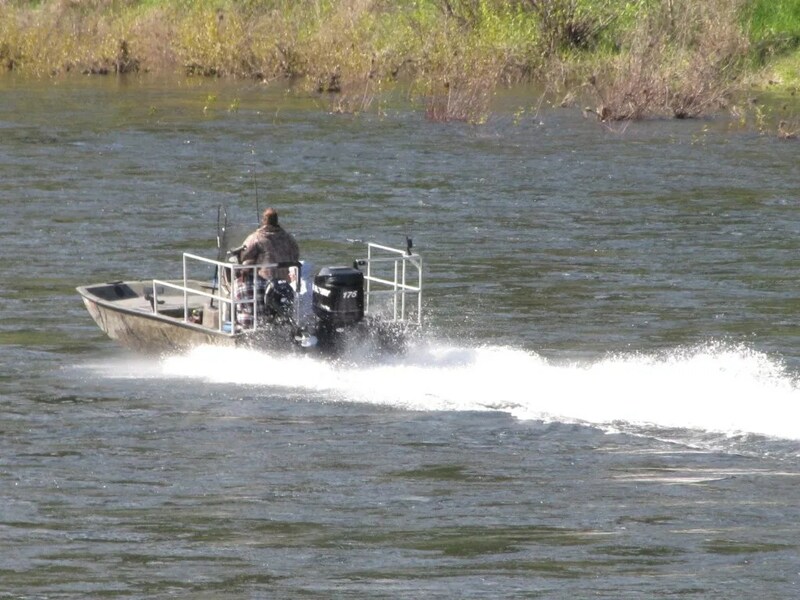 I could sit outside and watch the river and its human and wildlife voyagers for hours. From here you can see the lānai; we were up on the third floor right about in the middle of the building. Here we go! On to the next part of our adventure! 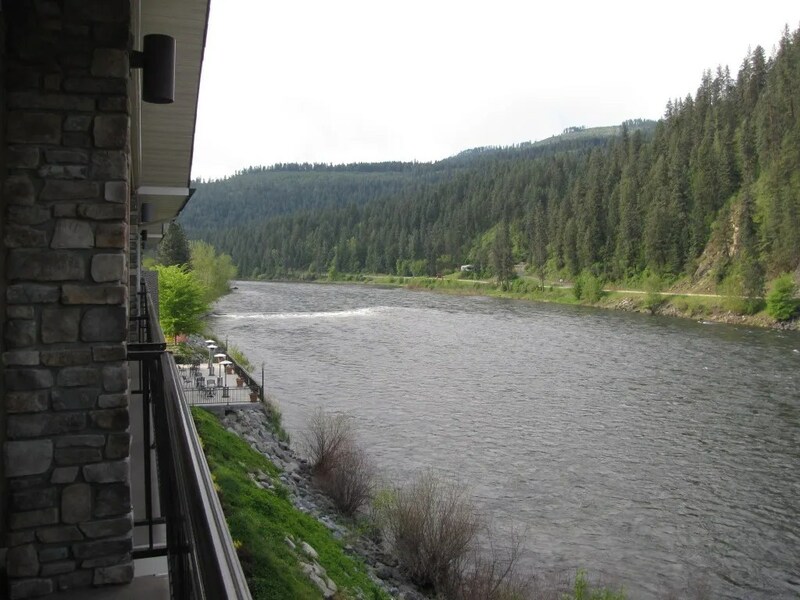 On the next part of our trip, we drive along the Clearwater River, so stay tuned, okay? Mahalo!